One day last year, a wish for FASD occurred to me. There are infinite variations, and any single one can be frustrating. Experience them multiple times over months, and you’ll just feel angry, overwhelmed, and burned out. But here’s the catch: Every one of those FASD behaviors already makes perfect and total sense. The challenge is we don’t often remember or understand what really causes those FASD behaviors. Those situations are accurately explained by memory problems, poor sense of time, sensory sensitivities, and learning disabilities, respectively. And the root cause of them all? Prenatal alcohol exposure and trauma. 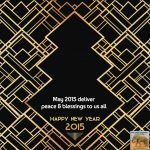 So, may 2015 bring peace and blessings to you and yours.